Google car to protect pedestrians with...flypaper tech? Google car to protect pedestrians with…flypaper tech? Google has filed a patent application for the “sticky bonnet,” which, in the event of a collision between its autonomous car and a pedestrian, would stick the pedestrian to the car. In the patent, published by the the United States Patent and Trademark Office (USPTO), Google said that if the car is able to hold the pedestrian and slow down, it will reduce the amount of damage to both parties. See Also: Queen’s Speech legalizes autonomous cars in the U.K.
Google uses an adhesive coating on the bonnet to make the human stick, which wears off once the car slows down. The company claims it has built the new adhesive with its autonomous car in mind, but car manufacturers could license the patent, if they’re interested. Is this basically pedestrian flypaper? 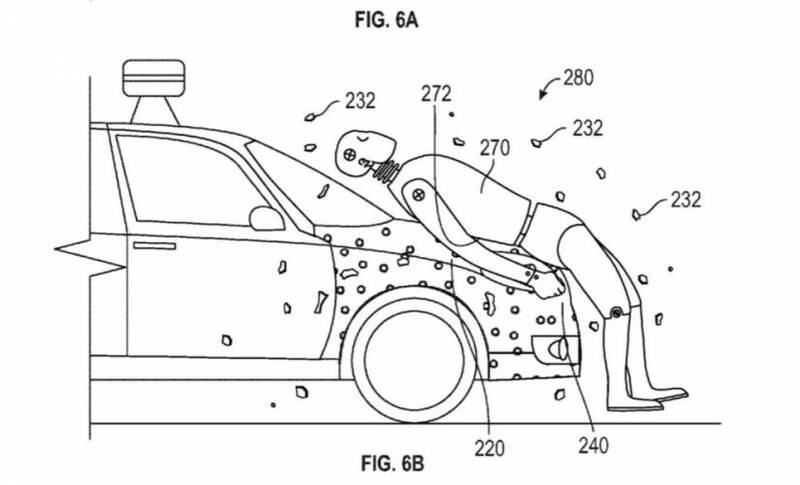 “Ideally, the adhesive coating on the front portion of the vehicle may be activated on contact and will be able to adhere to the pedestrian nearly instantaneously,” said Google in the patent application. “This instantaneous or nearly-instantaneous action may help to constrain the movement of the pedestrian, who may be carried on the front end of the vehicle until the driver of the vehicle (or the vehicle itself in the case of an autonomous vehicle) reacts to the incident and applies the brakes. Google wants to minimize the amount of collisions on the road, whether it’s with cars or humans. While this adhesive won’t prevent collisions, it should make the damages a lot lower, something Google will have to factor in if it provides insurance for its cars. The autonomous car fleet, which numbers at just over 100, has been involved in a few accidents. Most have been human drivers fault, though one video shows the Google car definitely in the wrong, crashing into the side of a moving bus.